Beau condo de luxe Canmore au cœur des Rocheuses canadiennes avec vue sur les montagnes depuis toutes les fenêtres. À un pâté de maisons des magasins et des restaurants de Main Street. Des chemins de murs très proches. Salon de détente avec Internet WIFI et télévision par câble. Grande terrasse ensoleillée avec barbecue à gaz et tous les ustensiles. Remarque: les bottes de ski, les poteaux de ski, les skis, les snowboards ne sont PAS autorisés dans l'unité car ils peuvent endommager les sols et les murs intérieurs. Super endroit,appartement au top.Equipement au rendez-vous.A recommader! Wir haben den Aufenthalt in der Ferienwohnung sehr genossen. Lage und Blick dürften kaum zu toppen sein. Lage super zentral, mit Mainstreet, Cafés, Supermärkten und sonstigen Einkaufsmöglichkeiten gleich um die Ecke, genauso wie dem traumhaften Bowriver. Dazu ein sehr praktischer Tiefgaragenplatz, und ein Gasgrill auf dem Balkon. Betten sehr bequem, Ausstattung der Wohnung alles in allem auch sehr gut. Besonders erfreulich, dass viele Dinge des täglichen Bedarfs vorhanden sind, wie zB Gewürze, Essig/Öl, Tee, Müllbeutel, Toilettenpapier, Servietten, Wasch- und Spülmittel, Seife, Shampoo, Batterien etc, was nicht selbstverständlich ist. WLAN auch schnell und sehr stabil. Kontakt zu Cal, dem Vermieter, sowohl im Vorfeld, als auch während des Aufenthaltes wie auch danach per WhatsApp, immer super freundlich und auf Nachfragen unmittelbar reagierend. Ganz herzlichen Dank! Wir kommen gerne wieder! We enjoyed the spectacular view from the living room window, the glorious spring weather, and the convenient location. 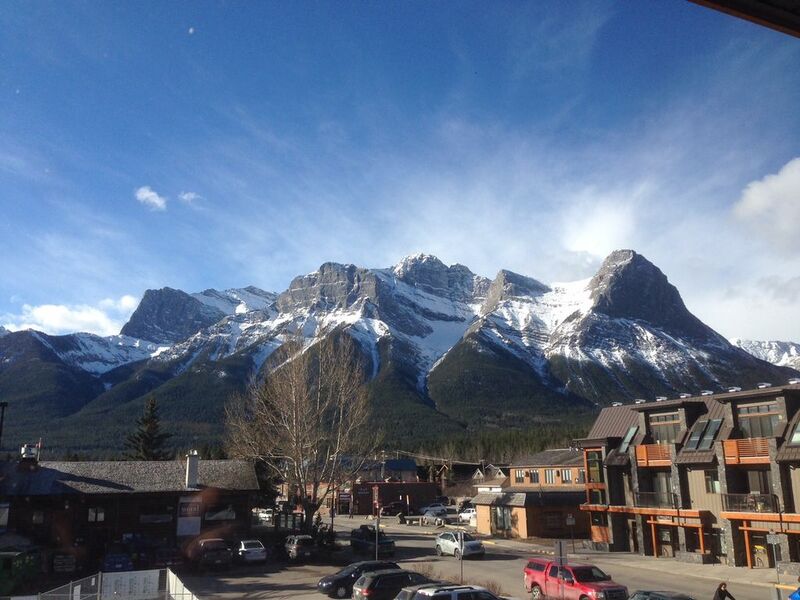 My wife and I are in Canmore once or twice a year for visits of approximately 2 weeks each time. We have stayed in a number of condo units in the building and find this one to be the best. It is conveniently located for access from both the indoor parking lot and walk up from outside. The layout is excellent with a view over the court yard, the kitchen is well equipped, and the audio-visual aspects (t.v., Netflix, DVD, Wii) are abundant. The unit standouts because of its wonderful original artwork, uncommon in other units. The owner/manager is easy to communicate with and very helpful. I highly recommend this property. Second floor condo with stunning views of the mountains. A homey space with a gas fire place that was most welcome when the temperatures plummeted. The kitchen had all the utensils, pots and pans a person would need and, they were in very good condition. The condo was up to date and very well cared for. Only a block to the Main Street and great dining and shops. A soaker tub was there to relax in after a day of skiing. The host was available, quick to respond to a question we had and offered a few suggestions for trails. We could tell he cared about our comfort and wanted us to enjoy this town as much as he did. There was an underground garage that was most welcome with the frigid temperatures. It had elevator access which made loading and unloading luggage easy. Lots of maps were available which was fun, we began to plan for a summer trip with bikes in tow. Our family has stayed at this property a number of times. The quality of furnishings and well equipped kitchen is like being at home. The location in the town centre is a big bonus. The owner has also included many books and guides to the local area for enjoying the Rockies. All of this makes for a relaxing getaway! No Pets. Smoking is not Permitted anywhere in the building Rates are subject to change until booking is confirmed.